Local Fat Reduction & Cellulite Treatment It is the optimized RF technology special suction system providing the effects of 1Mhz Multipolar RF/ Vacuum/Red LED Light Therapy. And it provides 4 types of dynamic and powerful vibrations for perfect and safe treatments without any pain. FAT Reduction & Cellulite Treatment Powerful cavitational performance by dual generator Stable & Effective 36KHz frequency Operating signal light function Effect to deep fat lay treatment Short treatment time, No-pain, Long lasting result. * Multi-Polar RF with Red/Blue LED Specialized Multi-Polar/Tri-polar RF Treatment Body Reshaping & Cellulite improvement Facial Lifting, Wrinkle & Tightening Maximize the effect by optimum RF frequency (1&2 MHz) Possible to professional RF treatment by 3 different size of specialized applicators. You can select a type of the hand piece you want to use on the LCD screen. Select “Cavitation/RF & Vacuum” for the body Select “RF & Vacuum” for the face. 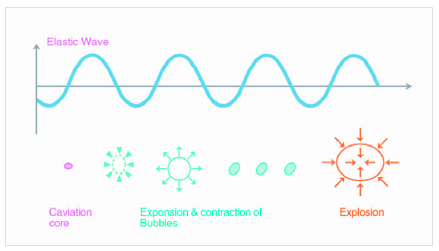 – cavitation is a process of ultrasounds to generate micro-cavities (bubbles) which grow up until implosion. – Through the continuing implosion, the bubbles emit pressure wave in the liquids, which stimulates the activity between the adipocytes and the intercellular liquids.